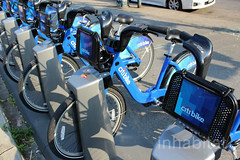 Actually bike sharing turns out to be both bike and subscription. Unlike owning and riding a bike at your personal convenience, Citi Bike prompts you to subscribe for the privilege of riding during one of three prepaid time periods: 24 hours, one week or one year. Always value-conscious, I chose a 24-hour subscription on Independence Day to enjoy the experience and learn what Citi Biking could bring. As I quickly learned, bike sharing resembled mass transit on two wheels where you got to be both conductor and passenger. Rather than touring as you pleased, the user experience resembled mass transit. You biked to another station within 30 minutes and docked your bike. Otherwise, charges would apply. Okay, I could deal with that I thought as I pedaled down my first blocks. Then, as I reached my destination (a state park), the “deal” became clear. The docking station with 30 or so bikes served the purpose of a “subway” stop, letting you walk to your final destination. For me, that added several minutes in mid-day heat and sun. At least the public park would be free of Citi logo ad placements. Returning to the station, apparently I hadn’t docked firmly enough. I couldn’t unlock a new bike. A biking concierge was on site to help answer my questions and guide me through the process. Eureka—I wasn’t alone in my experience. He explained the problem and quickly offered a solution: calling customer service. He remained close during my call. That was certainly new to my bike touring ears! Immediately a rep answered my call (pretty good for July Fourth!) and walked me through the process. Literally. The rep stayed on the line until the problem was resolved and I had a new bike unlocked and ready to go. Both concierge and phone rep worked in tandem to optimize my bicycling user experience. Oh, now I was beginning to see what bike sharing was all about. There was a business model at work. Subscribe for conveniences while forsaking some personal preferences. I experienced NYC bicycling empowerment at an enhanced level. I was fully engaged in the program as other Citi Bikers gave a thumbs up as I pedaled by, or chatted as I docked in and out. That’s not a bad experience, just different from the open road of touring with your bike. The bike was heavy to handle. But that’s the price of convenience and sharing. In the end, it was the customer service and care that struck me most of all. Kind of an interesting lesson for Independence Day, when you think about it. Bikes equal, people equal, bicycling out our American Dream 30 minutes at a time.